The truth revealed is more shocking—and hilarious—than you could ever guess. What do your friends really think of you? The truth revealed in this conversation-starting party game for adults is more shocking—and hilarious—than you could ever guess. Players take turns reading revealing questions that begin with the words "Who in the room." They range from the hypothetical ("Who in the room would survive the least amount of time on a desert island?") to the awkward ("Who in the room pees in the shower?"). After a moment to think, everyone reveals their answer by pointing at the same time. 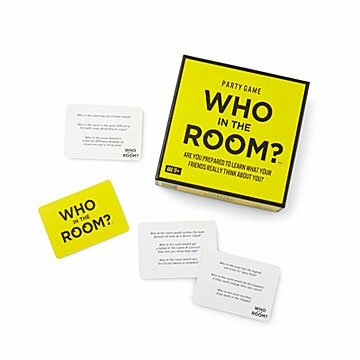 With more than 300 questions, this game will spark debate and laughter for many evenings to come. Made in Poland. We played with our extended family at Christmas and had a blast. It is not for kids. We played with older high school aged, college aged, and adults, and still had a few questions that were a little too risque. We just skipped those questions. Super fun and hilarious game! Really fun to play with friends or family. Just edit it the uncomfortable questions when playing with family! My nephew frequently hosts large gatherings, and this game is perfect for such occasions. I bought this for a friend for her birthday, she loves games and this one was fun and different than what we typically play! Fun for a family that likes to point fingers anyway. It can be a PG or 21+ game, so very versatile and fun to play. Any friend or family get together.